In constant exploration, my work moves in different directions, embracing variety of style and content. 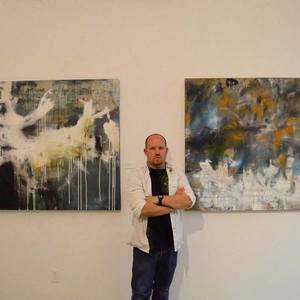 While my work is primarily abstract, the foundations are born out of autobiographical themes and draw on personal emotional consciousness and unconsciousness. Stemming from my own personal experiences my work is about the human experience. The series “Misspent Clarity” at the Conley Art Gallery explored my unconscious and conscious thoughts and feelings I had about different situations I experienced involving my Mother. My Mother suffers with schizophrenia, which has extremely effected her life as well as her family. For my work the use of abstraction is a symbol for the mind and how complex and chaotic it functions, it also reflects the unknown, the part of life that we as humans cannot comprehend. Chance and control in the process of painting, and how it relates to human experience of the same chance and control, has become increasingly important in my work.